The training rides are over. 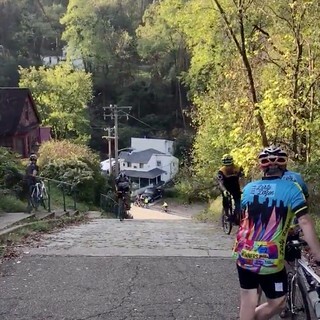 Now it’s time for the main event: my first ever Dirty Dozen, climbing 13 of the steepest hills in this stupidly hilly town. I give a little more background in this blogpost following last year’s first (and last) training ride. It’ll probably be the most difficult athletic achievement of my life. 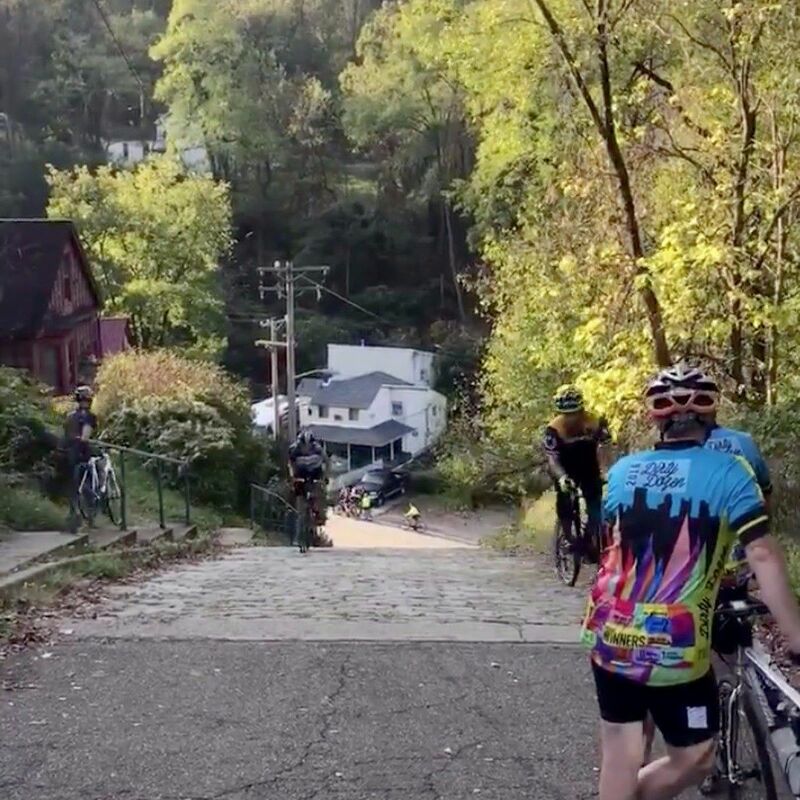 It’s been a long time since I experienced the dread I felt when the “2017 Pittsburgh Dirty Dozen Bike Ride” event started showing up in the sidebar of my Facebook page last weekend! My (center left) first time riding up the steepest street on the planet: Canton Ave! Yow! This ride has been my sole focus for the past two months. In the middle of each week I did solo training rides on those hills, then group training rides organized by the WPW on the weekends. There were seven of those official group training rides. The first four weeks introduced riders to each of the successive quarters of the route (3-4 hills per ride). The next two weeks stepped it up to traverse the first and second halves (6-7 hills per day). And then the final session a week and a half ago spanned the entire route, all 13 hills in one day! That was a day for the Flahutes: the hard men. When I set out, it was 17°—setting a new daily low temperature record in Pittsburgh—and the wind chill was a mere 7°. Despite all my training and preparedness, I wound up dabbing four times: once on Suffolk when someone fell in front of me (video), once on Boustead to wait for a huge moving van, and on the last two hills because my legs were just done. And for the first time ever, I had serious biceps cramps from pulling so hard on the handlebars. That’s when I learned that there really is an immense difference between climbing 4-8 impossible hills and doing 13. Since the middle of September, I’ve done every hill at least twice, some more than a dozen times. Add all those sessions together, and I’ve climbed a total of 75 Dirty Dozen hills. Aside from the as yet unknown (but usually inclement) weather (current forecast: 38-50° with 30% POP), I’m as ready as I could ever be. Along the way I’ve learned a lot about these specific hills, and about how to tackle steep climbs in general. I’ll save all that for my post-ride report, once the pudding has been proofed. If you’re sitting around bored next Saturday, the race is going to be live streamed by Cycling Fusion on perhaps Facebook Live or YouTube or Vimeo, and it should run from around 9am to 3pm or so. Otherwise, stay tuned for the full ride report. It should be pretty superlative.